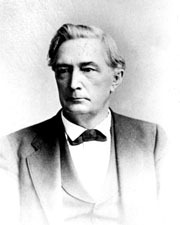 COLQUITT, Alfred Holt, (son of Walter Terry Colquitt), a Representative and a Senator from Georgia; born in Monroe, Walton County, Ga., April 20, 1824; attended school in Monroe and graduated from Princeton College in 1844; studied law; admitted to the bar in 1846 and commenced practice in Monroe, Ga.; served as a staff officer with the rank of major during the Mexican War; elected to the Thirty-third Congress (March 4, 1853-March 3, 1855); was not a candidate for renomination in 1854; member, State house of representatives 1859; member of the State secession convention in 1861; entered the Confederate Army and served throughout the Civil War, attaining the rank of major general; Governor of Georgia 1876-1880; reelected under a new constitution for two years; elected as a Democrat to the United States Senate in 1883; reelected in 1888 and served from March 4, 1883, until his death in Washington, D.C., March 26, 1894; chairman, Committee on Post Office and Post Roads (Fifty-third Congress); interment in Rose Hill Cemetery, Macon, Bibb County, Ga. Dictionary of American Biography; Wynne, Lewis. The Bourbon Triumvirate: A Reconsideration. Atlanta Historical Journal 24 (Summer 1980): 39-56; U.S. Congress. Memorial Addresses for Alfred Holt Colquitt. 53d Cong., 3d sess., 1895. Washington: Government Printing Office, 1895.